Good spec for the price. Available from monday 16th Feb.
Its part of a power tool series sharing the same charger and battery. Also available is a jigsaw and circular saw. Would be better if they offered batteries aswell,seems they want people to buy an additional tool to get a second battery. looks good anyone got any reviews? sounds good 2 me most parkside stuff is usually good, u can buy brand names drills with bigger price ranges and less power. Lidl are usually good with returns. good drill but keep receipts bargain hunters then no problem in store returns. looks ok but id love 2 batteries so one can be charging while using the other even if it cost a little more. Hard to know if a good price or not as unsure if 1 battery or 2 and what capacity is the battery or batteries? 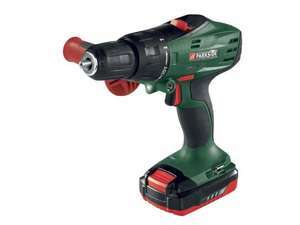 The drill itself looks reasonable spec but if its limited by one low capacity battery then not so good. Getting additional batteries in the future will be more difficult to being a shop branded product although its possible Einhell do replacement batteries suitable for this that match the batteries of the tools they source for Aldi and Lidl. I have the 10v Bosch drill £50 from B&Q a good compact drill,the Parkside drill is larger and probably a little more powerfull. The Parkside drill is cheaper with a longer warranty. Both should be good for home use depending if you need the highest power or prefer the compact size of the Bosch. You can get additional batteries from the Parkside manufacturer here kompernass.com/ind…hop price £21.50 + £4.20 delivery. They are 1.3Ah I believe. You can get additional batteries from the Parkside manufacturer here … You can get additional batteries from the Parkside manufacturer here https://www.kompernass.com/index.php?route=common/shop price £21.50 + £4.20 delivery. They are 1.3Ah I believe. That's a poor price for a single low capacity battery. You'd be better off putting that £26 plus the cost of the lidl drill towards a better drill that comes with 2 batteries or a branded drill with only one higher capacity battery. You can often get discounted batteries for common models on ebay. That's a poor price for a single low capacity battery. You'd be better … That's a poor price for a single low capacity battery. You'd be better off putting that £26 plus the cost of the lidl drill towards a better drill that comes with 2 batteries or a branded drill with only one higher capacity battery.You can often get discounted batteries for common models on ebay. Could you recommend a better drill for the same price? So for £40 this is good value yes? This is a scorching deal. Parkside tools tend to be decent. 1.3Ah 18V fast charge Li-ion battery drill with 40Nm of torque is comparable with my Hitachi which cost more than twice the price. and 3 year warranty too. this will get hot at sub £40. good post op. 1.3ah won't last very long really, if your drilling and screwing, that's why you need 2 batteries, I was lucky enough to get a 18v Site (Makita) drill with 3 batteries and 30 minute charger for £49.99 from Screwfix a couple of years back and its still going strong. This has been re- posted - and already got more heat than this! The other deal will eventually be "spammed" but there's something massively wrong with the HUKD system of deal posting/monitoring which is getting worse! You can get additional batteries from the Parkside manufacturer here … You can get additional batteries from the Parkside manufacturer here https://www.kompernass.com/index.php?route=common/shop price £21.50 + £4.20 delivery. An even better deal then, nice to see the price has come down, makes it even more attractive. What is the postage though? Parkside are sourced through einhell tools which is a low end chinese tool importer based in germany. Doesn't mean they are bad tools but shop brand quality. That said the spec of the drill looks really good the only compromise seems to be a low capacity single battery. Ordering from kompass seems poor value for additional batteries if you are only buying one. I assume its £21.50 including postage for a single 1.3Ah battery. The real bargain here is if you also need cordless jigsaw or circular saw. That way you end up with the 2 batteries that makes either tool more practical. I bought both the drill and the circular saw this morning. The batteries are actually rated at 1.5Ah. Whatever, this is still a scorcher of a bargain for a diy-er when compared with what else there is out there. Yep just bought the drill as well. Will buy an extra battery also. Bit annoyed it isn't in a case, but I guess thats the price you pay. I am just getting into woodworking, and need a drill and a circular saw, so grabbing both would give me that spare battery everyone wants. Would this be suitable for driving screws, aswell? I am just getting into woodworking, and need a drill and a circular saw, … I am just getting into woodworking, and need a drill and a circular saw, so grabbing both would give me that spare battery everyone wants. Would this be suitable for driving screws, aswell? Yes perfect, reduce the speed to slow and lower the torque setting so you don't over do it. The drill will click when it has reached the torque you have set. I agree with most of you that have said it's a good deal after reading all the comments. They are, just ordered one, so I think the deal is extremely good. The warranty only covers claims for material and manufacturing defects, not for damage sustained during transport, components subject to wear and tear or damage to fragile components such as switches or batteries. This appliance is intended solely for private use and not for commercial purposes. No manufacturer will guarantee batteries as far as I know. I think you have been unlucky with your batteries,you can get a dud one which will fail after little use,but generally they last well, some of mine are over 3yrs old. I think you have been unlucky with your batteries,you can get a dud one … I think you have been unlucky with your batteries,you can get a dud one which will fail after little use,but generally they last well, some of mine are over 3yrs old. Still plenty of stock left in my local Lidl - and there's a £5 off £40 spend in today's papers.